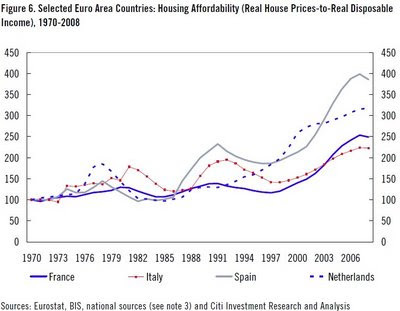 ...according to Citigroup research in their Euro Weekly note entitled "Housing Bust". 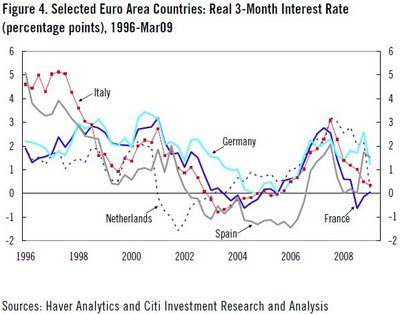 Yes, deflating news for euro property owners. 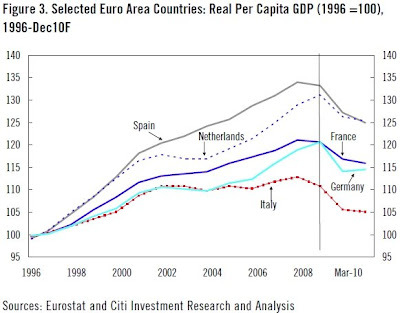 Citi's trio of analysts Michael Saunders, Jürgen Michels and Giada Giani are calling for the bust in several European Union (EU) nations on the basis of a departure by prices from the fundamentals that have driven them over the last 15 years. 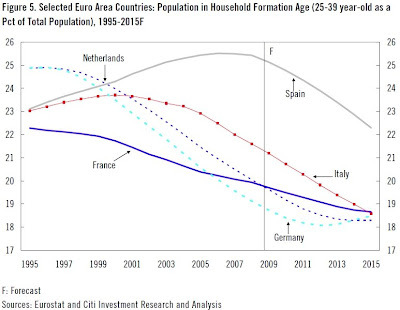 They foresee price drops of 10%-15% by 2010 and 20% - 30% over the next 4 to 5 years. There is more than a hint of confirmation bias in the report – property bears are de rigeur nowadays. 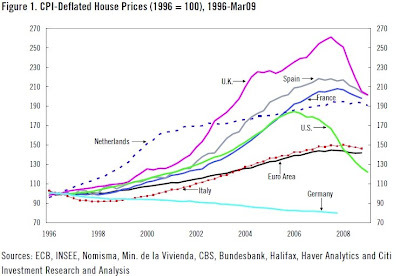 And, despite its tabloid title, the data aligns more with the observed inexorable, slow hiss of price deflation ongoing in much of this scribe’s corner of France as sellers come to realise they won't get even last year's prices now - much less those of 2007. Not talking my own book or anything, but starting point on these time series is everything. The nadir of France's previous bust was 96 (mas o menos). The recovery was not unusual given the depths it plumbed previously.